The first quarter started off strong, mainly due to the high activity levels of the last quarter of 2017. By 2nd Quarter, the pace of sales slowed down a bit and and our Average Sales Price held steady. Inventory levels continue to be lower than normal. Our pending inventory coming into the year was lower than usual, which most likely will translate into a slower 1st Quarter of 2019. The Market continued at a brisk pace throughout the year. Inventory was low and activity levels were high creating an even smaller inventory of homes. Prices climbed and will continue to do so if the supply continues to lag behind the demand. The new Tax Reform will the item to watch in 2018 as well as the continuous ‘show’ in Washington, DC. Buyer activity has been impressive all year long. 2016 ended with a higher number of units closed than 2015. This is putting pressure on inventory which is running a bit behind normal levels. Days on market decreased slightly and % of final list price to sale ratio is staying roughly at 95%. All points toward a healthy market as we head into 2017. LBI experienced one of the coldest winters on record as well as our surrounding area. This weather put a damper of potential buyers coming to look at homes during the first quarter. However, as we progressed towards March we saw activity pick up and a very nice rebound. Inventory increased slightly throughout the year as did sales activity. 2015 ended the year on the upbeat with increased sales and increased prices. The year ended on a high note, with more units sold and a slightly higher average sales price than 2013. Inventory levels remain a bit low so the pressure is on and a continued price increase is expected for 2015. LBI seems to have bounced back from Sandy’s visit and is getting back to pre Sandy levels. Overall the LBI market handled our visit from Sandy rather well. 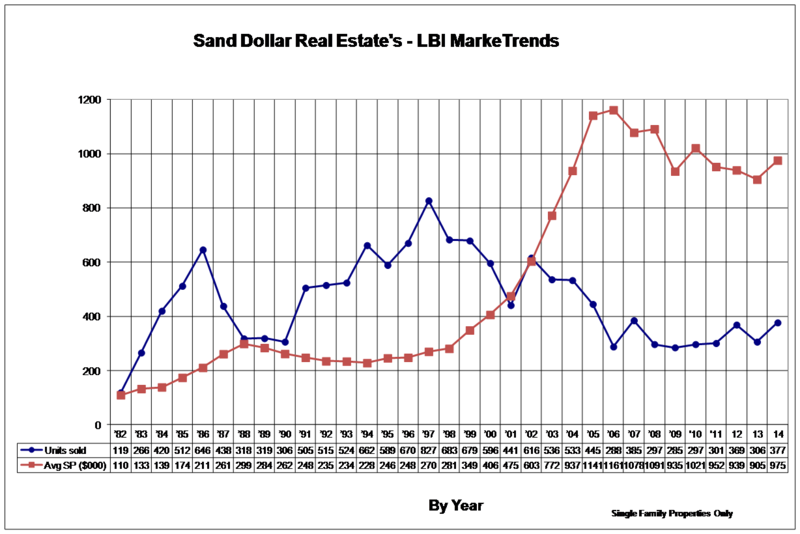 It should be noted that from last quarter of 2012 through the first quarter of 2013 the LBI real estate market was at a relative stand still due to the aftermath of the storm and the many unknowns facing LBI. By the end of the second quarter of 2013, the press and the public began to realize that LBI was very much alive and beginning to return to pre storm status. Buyer activity picked up late in the second quarter. Considering that LBI lost almost 6 months of sales activity we closed the year out with only a 17% decrease in units closed over 2012 and the Average Sales Price was down 4% over the prior year. As of January 7, 2017: single family = 359 units condo = 67 Total of 426 units. This is a bit lower than normal. As of April 19, 2017: single family = 393 units condo = 77 Total of 470 units. This is very low for this time of year. Long Beach Island is not immune to the various economic cycles that all real estate markets go through as can be seen in the above graph. However, over the years LBI has weathered rather well. LBI real estate is usually the last to feel the effects of an economic downturn and one of the first markets out of a recovery cycle. There are very few other markets that can offer the stability that LBI offers a real estate investor.